All learning is relearning. Leadership Learning is best facilitated by a process that draws out the students’ beliefs and ideas about the topic so that they can be examined, tested, and integrated with new, more refined ideas. Learning requires the resolution of conflicts between dialectically opposed modes of adaptation to the world. Conflict, differences, and disagreement are what drive the learning process and what the work of leadership looks like. In the process of learning, one is called upon to move back and forth between opposing modes of reflection and action and feeling and thinking. Learning is a holistic process of adaptation to the world that involves not just the result of cognition but involves the integrated functioning of the total person— thinking, feeling, perceiving, and behaving. Learning results from synergetic transactions between the person and the environment. In Piaget’s terms, learning occurs through equilibration of the dialectic processes of assimilating new experiences into existing concepts and accommodating existing concepts to new experience. 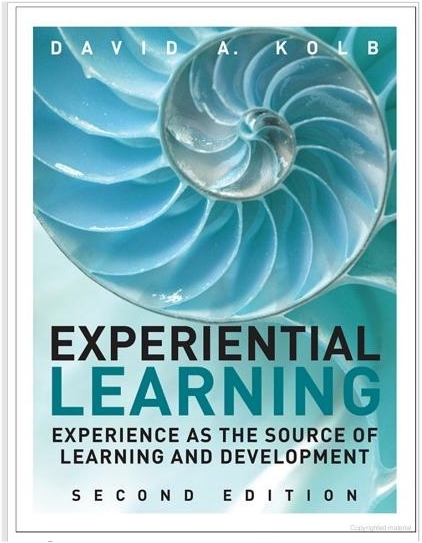 Learning is the process of creating knowledge.Experiential learning theory proposes a constructivist theory of learning whereby social knowledge is created and recreated in the personal knowledge of the learner. This stands in contrast to the “transmission” model on which much current educational practice is based, where pre-existing fixed ideas are transmitted to the learner. Experiential Learning Theory defines learning as “the process whereby knowledge is created through the transformation of experience. Knowledge results from the combination of grasping and transforming experience”. (Kolb 1984). What would your team be able to accomplish when leadership is taught no longer using the “transmission” model but facilitating leadership experiential learning?